Fifty five years ago today, three stars of the first wave of Rock and Roll, Buddy Holly, Ritchie Valens and J.P. “The Big Bopper” Richardson were killed when their chartered Beechcraft Bonanza plane crashed in a snowstorm a few minutes after takeoff from Mason City, Iowa on a flight headed for Moorehead, Minnesota. Investigators blamed the crash on bad weather and pilot error. Because of mechanical difficulties with the bus for the Winter Dance Party Tour, Buddy Holly had chartered a plane for his band. 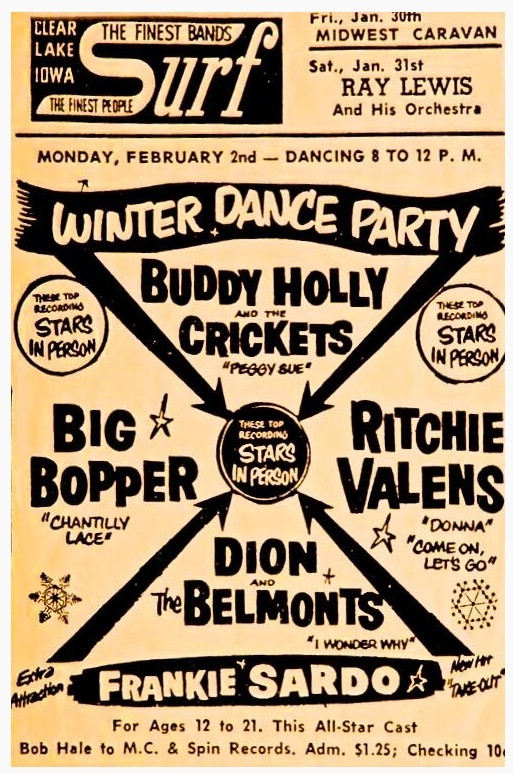 The Big Bopper, sick with the flu, convinced a member of Holly’s band, Waylon Jennings, to give up his seat, and Ritchie Valens won a coin toss for another seat on the plane. Born Charles Hardin Holley in Lubbock, Texas, Buddy Holly was just 22 when he died. He began his musical career as a boy playing bluegrass and country music. After seeing Elvis Presley perform in Lubbock, Buddy and three friends began to play their own version of “Rockabilly” under the name The Crickets. By the mid-1950s, Holly and his band had a regular radio show and toured internationally, playing hits like “Peggy Sue,” “Oh, Boy!,” “Maybe Baby” and “Early in the Morning.” Holly wrote all his own songs, many of which were released after his death and influenced such artists as The Beatles. The group had just scored a No. 1 hit with “That’ll Be the Day” prior to the 1959 tour. The third crash victim was Ritchie Valens, born Richard Valenzuela in a suburb of Los Angeles, who was only 17 when the plane went down but had already scored hits with “Come On, Let’s Go,” “Donna” and “La Bamba”. In 1987, Valens’ life was portrayed in the movie La Bamba, and the title song, performed by Los Lobos, became a No. 1 hit. Valens was posthumously inducted into the Rock and Roll Hall of Fame in 2001.